Villa Namuang in Koh Samui, is essentially your home away from home, offering spectacular views of the sea and the neighbouring mountains to its guests. The seven-bedroom private villa affords an exclusive and safe-haven to its guests with three living areas located on each of the three levels of the villa. The spacious structure of the villa offers guests to move around with ease, and enjoying the restful neighbourhood with friends and family. There are seven bedrooms in total at Villa Namuang, spread across the three floors of the property. Each of the bedrooms is spacious and air-conditioned, offering excellent scenes of the beautiful panorama. All the rooms are donned with beautiful artwork that enhances the aesthetics value of the rooms. While some of the bedrooms are furnished with double beds, some are furnished with twin-beds which are well-suited for children. Each of the seven bedrooms is accompanied by an en-suite bathroom which is fitted with a large soaking bathtub. As you enter through the gates, the 12-metre swimming pool greets you as it is located down a flight of steps. The pool is located within a glorious display of lush greenery overflowing with tropical plants and towering palm trees billowing in the wind. The breezy weather of the island of Samui adds a comforting and relaxing atmosphere, offering you the luxury to lounge on one of the sun chairs places beside the pool. After a rejuvenating dip, you can lie back and work on your holiday tan, as you take in the beauty of the island and relish the calming vibe of Villa Namuang. Just beside the pool, in the middle of tropical gardens, is a gazebo which houses an alfresco dining area, wherein you can dine out under the stars or during the day for a truly tropical experience. Villa Namuang boasts of not one or two but three living spaces on each of its three levels. The upper-most floor houses the largest of all the living areas, not to mention the beautiful views right outside its doors. The private balcony offers a remarkable and unobstructed view of the island and as you lie around on the extra comfy couches while the air-conditioners help to maintain the temperatures, you can appreciate the bounty of nature. There is a large flat-screen TV mounted on the wall, where you can watch films and spend quality time with your loved ones. The spacious dining area is furnished with a dining table and an equally spacious kitchen, fitted and equipped to perfection for your ease. There is even an outdoor sitting with rattan furniture, which is the perfect spot for a morning or evening tea. 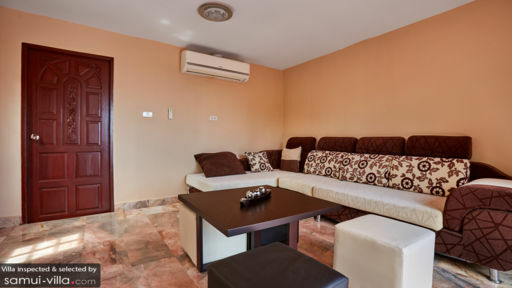 The other floors of Villa Namuang have smaller, more private, living spaces, with a sitting area complete with couches and flat-screen TVs as well as a dining table. 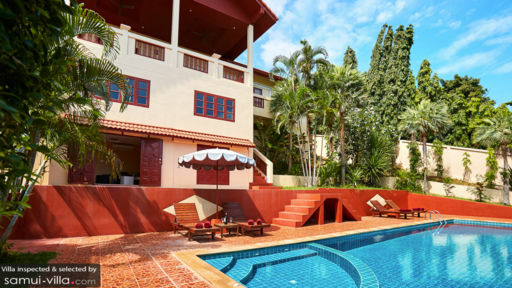 The villa is quite comfortable placed in a convenient location, and the staff at Villa Namuang will ensure that you get to experience absolute luxury while you stay here. If you require extra beds, you can always put in a request with the staff. There is daily housekeeping, and if required the villa can offer additional services such as rentals, island excursions, and in-house massages and spa treatments. 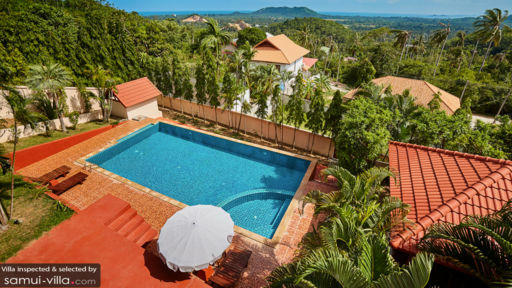 The villa is conveniently located close to the popular beaches of Koh Samui, and to top it off the Namuang waterfall is also not far from the property. Another exciting hotspot is the Elephant Trekking Camp, where guests can go for a hike and enjoy time with nature.